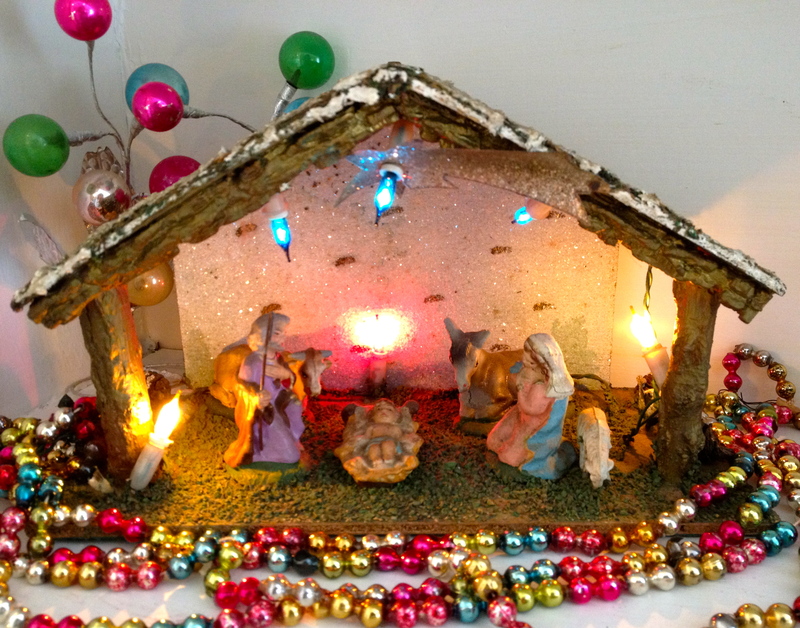 Tiny crèche scenes! I can’t resist them. This Japanese-made wooden one might not qualify as exactly “tiny”: it’s a whopping 9 inches across. But it has everything a proper crèche needs. See it all up close! Gah! Where did December go?! 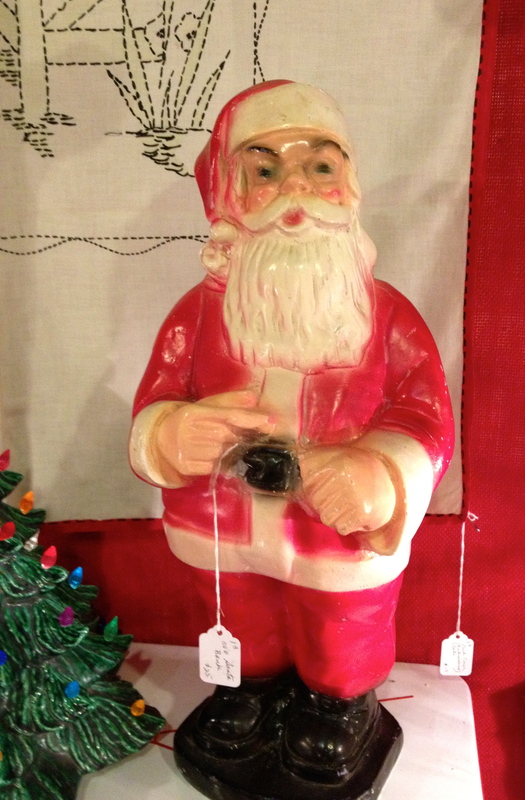 I had all these fabulous posts of vintage Christmas stuff planned in my head, and then . . . December just happened. We didn’t even get a tree up till last weekend. The now-empty ornament boxes are still waiting to go back out to the loft so we’re not tripping over them. There are a few more things to wrap. I have a pie to bake. Forget about making cookies, it ain’t happening. Ready or not, Santa Claus is coming to town. And boy, is he ever grumpy. 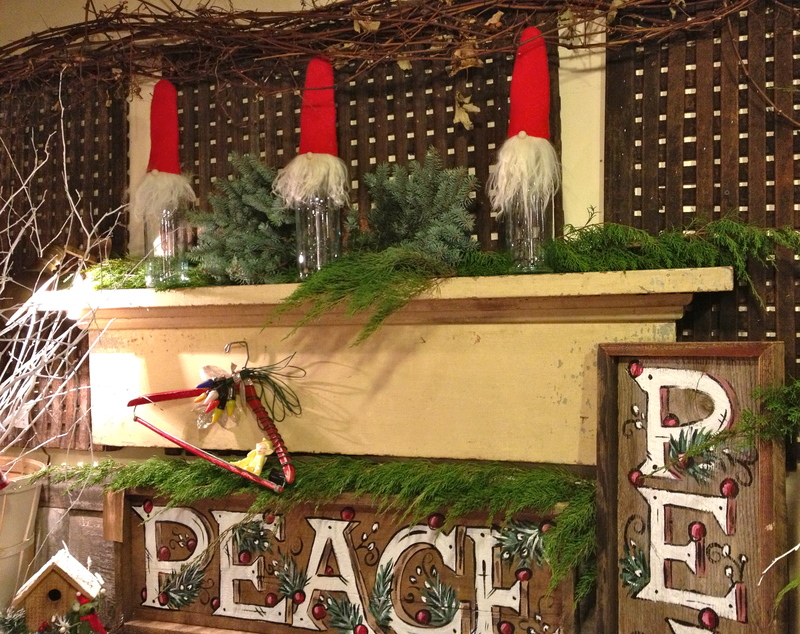 Here’s a fabulous display from one of my favorite dealers at last weekend’s Sage Farm “Dear Santa” show. That’s a solid old mantel top with lots of molding, plus chippy paint in pale yellow and green. Comical red-hatted elves atop glass vases. “Peace” signs handpainted on old framed boards. Lots of greens. And what’s that nailed up on the mantel? An old wooden suit hanger in bright red! 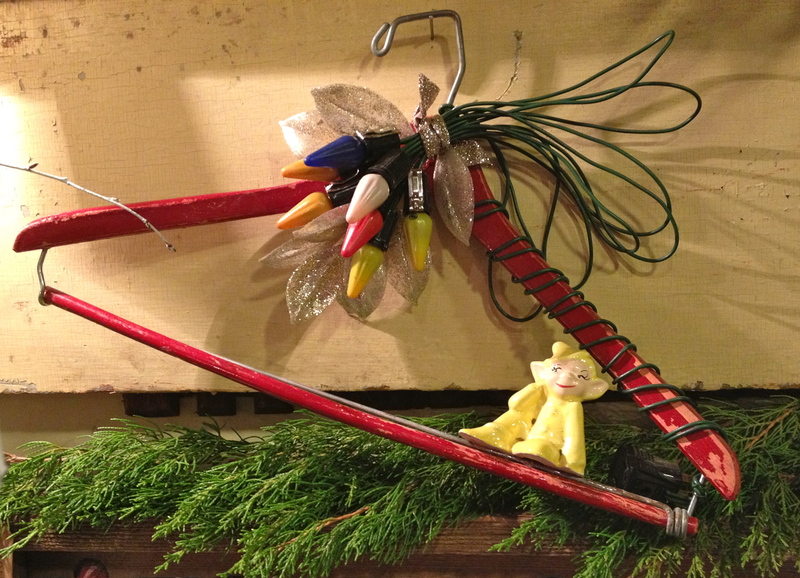 Wound with a string of vintage Christmas bulbs plus some tinselly sparkle and ribbon. And a cute little yellow elf glued securely on. Do you love that as much as I do? 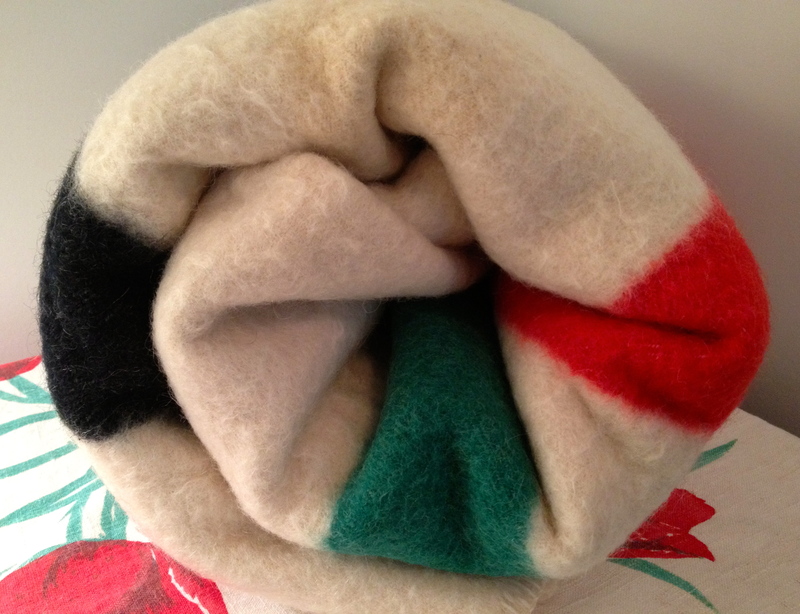 Blanket season starts with a Hudson’s Bay bang! Would you make a noise that sounded like a startled elephant? And simultaneously lunge for the hanger this thing was on, just in case the person standing 20 feet away completely mesmerized by the moving electric Santa dolls decided to grab it instead? Well, wouldja? Click to find out what *I* did! I can’t help myself. If it was textile-y at November’s Sage Farm show, I probably snapped a photo of it. 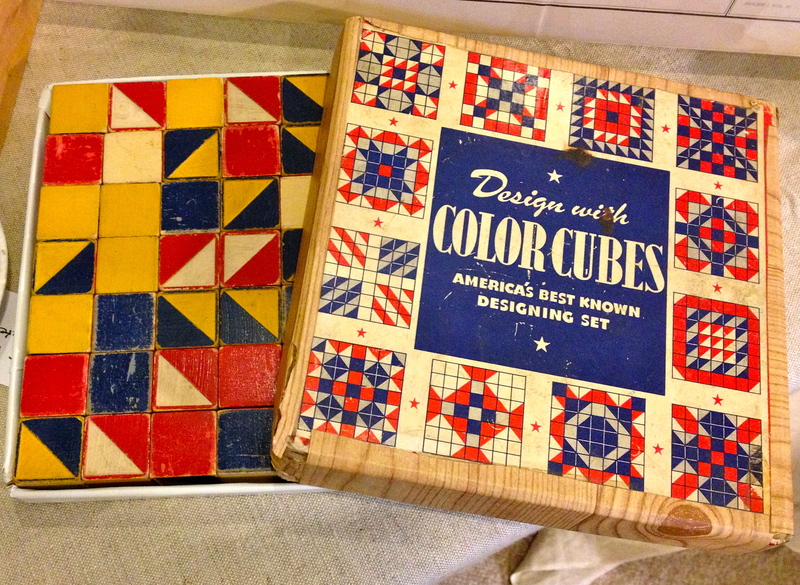 The same dealer who had the amazing Old Order Amish “Sunshine & Shadow” quilt also had this set of painted wooden “Color Cubes.” She didn’t think they were intended specifically for quilters, though. Instead, they were the equivalent of modern pattern blocks. My kids had a set of those and loved them! I can totally see a quilter playing around with these. See what else there is!